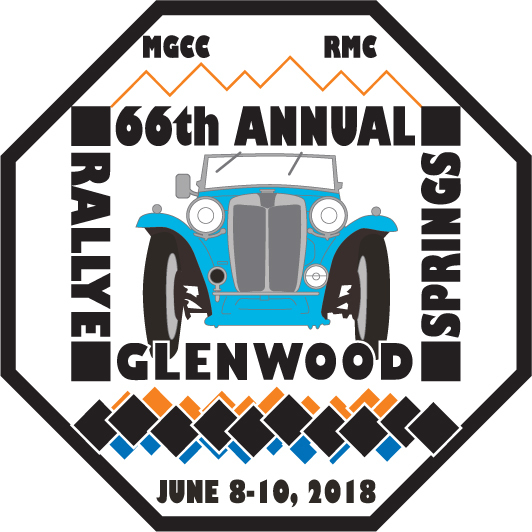 The MG Car Club – Rocky Mountain Centre invites you to join us for the 66th Annual Rallye Glenwood Springs, the oldest continually-held time-speed- distance rally in the United States, on Friday, Saturday, and Sunday, June 8, 9, 10, 2018. Since its inception, the MGCC-RMC has sponsored the Rallye, which began when a hardy group of sports car owners discovered the joys of motoring in Colorado in MGs that still had drop- down tops and running boards. The Rocky Mountains of central Colorado, with some of the most breathtaking scenery in America, formed the backdrop for the Rallye Glenwood Springs through 65 previous years. Vintage and classic cars from as far away as California and Illinois have shared the twisting mountain roads with their newer counterparts for octane-related festivities. Enthusiasts have come from as far away as England to drive their sports cars through such fabled Colorado mining towns as Leadville and Aspen on their way to Glenwood Springs. The host hotel for the 2018 Rallye Glenwood Springs will once again be the Courtyard Marriott. For those who want to clean off the road grime from the car from the trek up, we will have a wash area at the hotel on Friday afternoon and Saturday afternoon. We look forward to seeing all of our friends, acquaintances (and their cars) to swap car stories and lies once again. For out of town participants needing a place to stay Thursday night, some options are listed below. Rooms must be guaranteed with Credit Card or Prepayment. Mention you are with the MGCC Rallye Glenwood Springs for the group rate. Glenwood Springs, 970-947- 1300. Rates are $122 + tax per night. Discounts are valid until 5-12- 17. Marriot Residence Inn – 125 Wulfsohn Rd., Glenwood Springs 970-366- 5021. Rates are $133 + tax per night. No rooms are on hold, based on availability only. Best Western Antlers – Glenwood Springs 970-945- 8535.